The Japanese Shirasaya sword has become a popular choice among collectors in recent years. 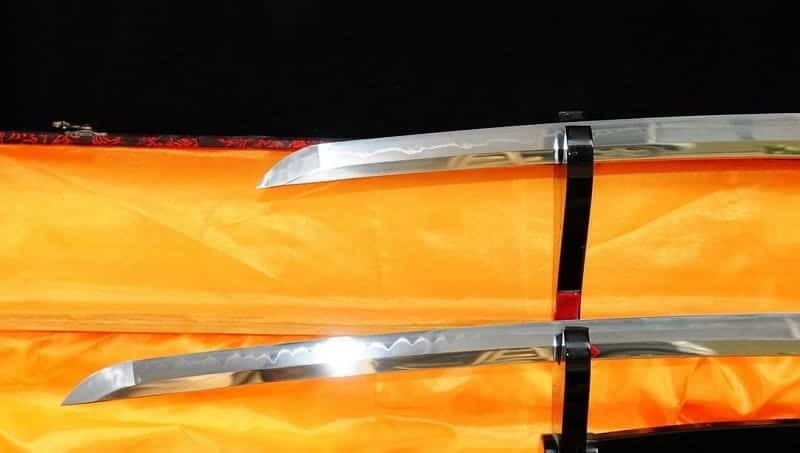 And while it does not share the same kind of fame that the likes of the Katana and Wakizashi enjoys, the discerning sword owner will eventually reach a stage where the shirasaya becomes a ‘must have’ item. However, looking for quality, hand-crafted shirasaya for sale can be a bit of a minefield. That’s why we have done the research to help you get started. Below you will find in depth reviews on 5 of the best shirasaya swords currently available online. For our findings at a glance check out the table below. For a dedicated buyer’s guide, plus full analysis of each sword, keep on reading. 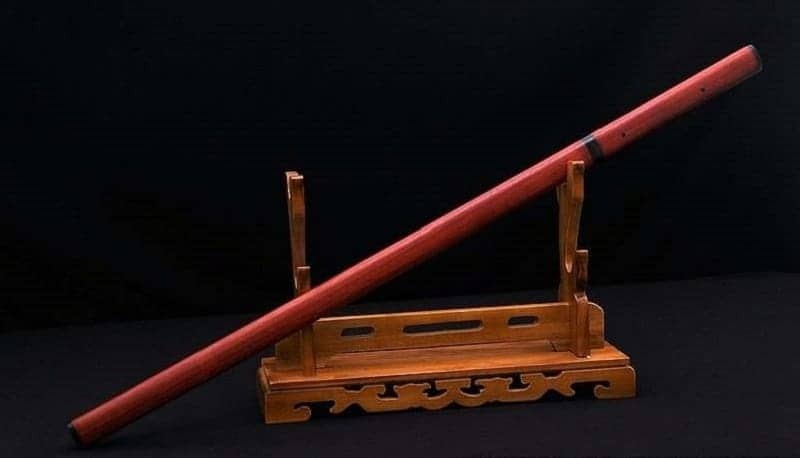 What is exactly is a Shirasaya? A Shirasaya is actually just a Japanese blade in a wooden holder. There are no embellishments. The handle is plain wood (typically one menuki) and you will find no wrap, tsuba or decorations upon the sheath or sword. 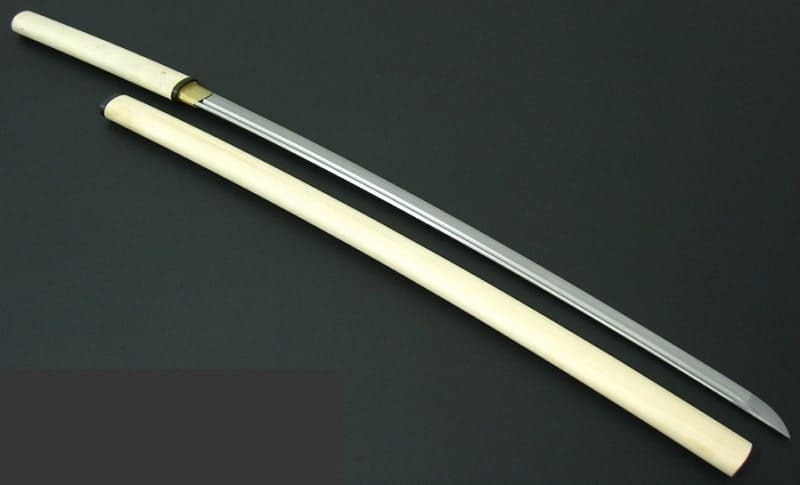 You see, the word shirasaya translated actually means “white scabbard.” This does not mean that all shirasaya are white however; the term is a reflection on the plain, non-decorative nature of the scabbard. In fact any blade can be housed in a shirasaya. The shirasaya first came about in response to the restrictive laws the government put upon the samarai class during the Edo period. The simplified aesthetic (i.e removing the tsuba) created a tighter seal around the blade which helped better protect the sword against the elements. This differs from the traditional Koshirae style scabbard which was designed to fit more loosely so that the sword could be drawn faster while in combat. 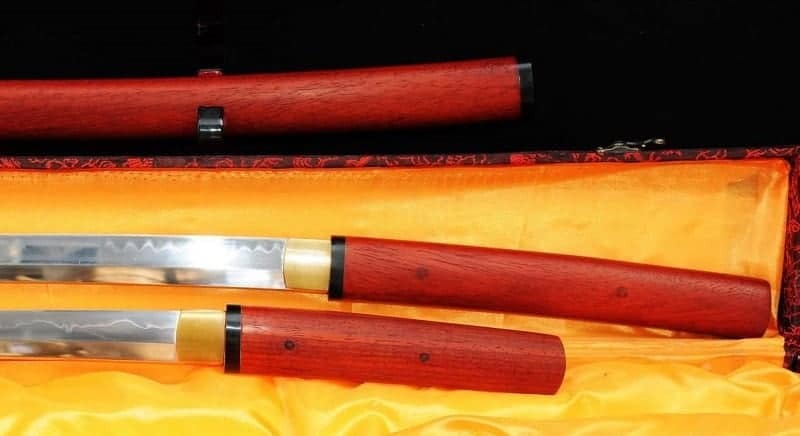 Due to the fact modern reproduction shirasaya are generally designed for display purposes, more visually appealing woods are used, (bamboo is a popular choice). The aesthetic is very much one of sleek, sophistication. The scabbard is designed to fit cleanly against the handle, so that when in place the entire construction appears to be made from a single, fluid piece of wood. True to the historical roots of the shirasaya, a modern reproduction will be undecorated on the outside. There is generally no tsuba or guard, (making the shirasaya impractical for combat) and the handle will not be wrapped. However, you may opt for (or find) a short text stating the type of blade that is housed inside. If you are looking for a shirasaya for sale, there are a few things to consider. 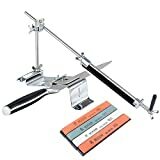 These apply whether you wish to purchase a custom design or something off the shelf. Display Purposes or Martial Arts? If you are planning on buying a shirasaya as a sleek display piece, you can stick closely to the historical style of the sword. However, if you are after something that can be used practically, you will need to follow a more hybrid approach and have certain things such as the hand guard added. If your purchase is for decoration, you may well need a display stand. Check whether one comes supplied. It may be visible in the stock photograph online, that doesn’t mean it will be part of the package that arrives at your door however. Essentially you need to determine whether a weapon is combat ready or labeled for display only before you buy. If you have the budget you should always choose traditional Japanese forging processes over modern shortcuts. This means paying extra for folded steel. Research your manufactuer of choice to ensure that they have the skills in order to create the sword to the level of quality you are after. Hand crafted techniques from forging, to sharpening and polishing are what you should aim for. The wood of the scabbard should be as high a quality as you can afford too. The finish will vary from craftsman to craftsman, so make sure to purchase the sword from a company with a prove reputation. Remember, not all brands follow the same production rules. The beginning of a collection? If your purchase is the beginning of a collection you need to plan ahead. Some collectors will want their display set of shirasaya swords in graduated sizes. It could be that you want complimenting colors to run through each sword. If you think that your purchase could be the start of something special, it is wise to consider how you would like the collection to grow in the future. Finally there is the issue of price. It is possible to pay as little as a $200 for a shirasaya sword. And a low budget entry can be a great way to start. However, the quality will not be there on the cheapest reproductions. If you intend to take your collecting seriously, it is very often better to wait until you have sufficient funds to buy the sword you will proud of for many years to come. 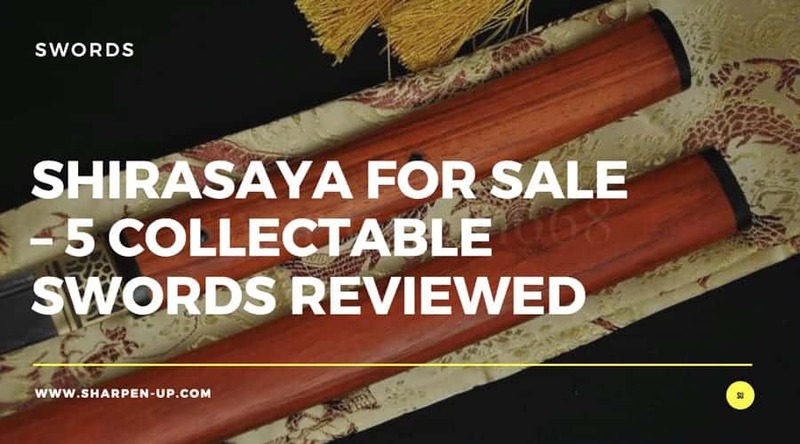 Now we have reached our review section covering what we consider to be 5 of the best shirasaya currently available to buy online. This is a selection from the very reputable Swords of Northshire, (you can find more about the company here). Our number one pick Shirasaya is sleek and extremely well made 1095 high carbon steel, clay tempered sword from Swords of Northshire. Strength is the key issue here and this katana has that in abundance. Made using traditional Japanese swordsmith techniques, the blade is repeatedly heat treated and the hand forged methods are used to remove the steel of impurities. The clay temper process adds to the strength as well as the aesthetic beauty of the sword. The steel is forged to be both tough yet flexible, and the process results in a genuine hamon (temper line) running through the blade. The blade is full tang of course. It is also hand sharpened and hand polished before it leaves the workshop. The minimal natural hardwood shirasaya style handle really sets this sword apart from the normal katana. The pictures do not do justice to the sophisticated design exhibited here. Extras such as the saya with buffalo horn and two mekugi fixtures (along with a subtle mei signature), all exude the same level of quality. Overall this shirasaya is a stunning combination of beauty and functionality. 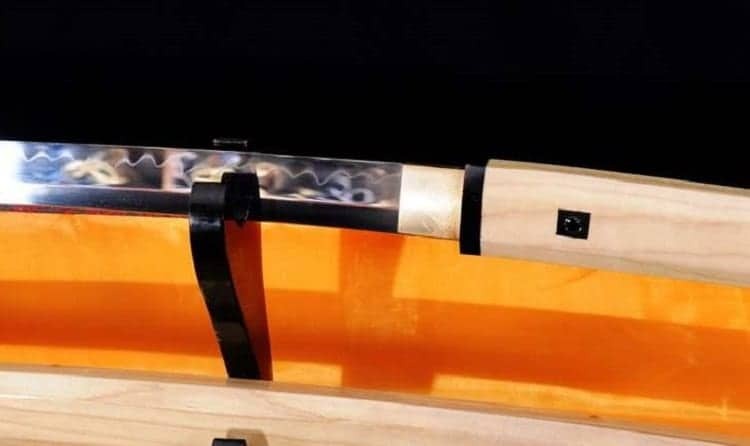 The sleek design lends itself to being a perfect display piece, however the strong, heat treated, clay tempered construction means this sword is just as useful in the dojo. And all at a very competitive price. Our number one pick shirasaya sword for good reason. If you are planning on starting a collection, this shirasaya sword set may well be exactly what you are looking for. As far as display swords go this package is difficult to beat. 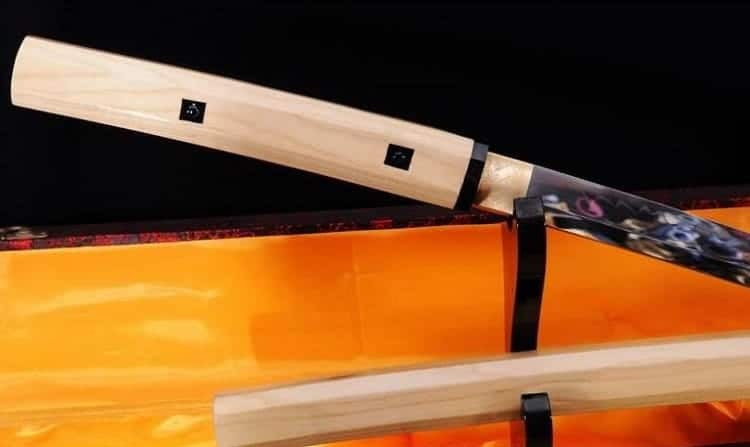 You get both the shirasaya katana and wakizashi in this collection; each is made from 1095 high carbon steel, using traditional Japanese methods. Like our number one pick these blades are repeatedly heat treated and hand forged to remove impurities. You have that beautiful aesthetic of the genuine hamon (temper line) all as a result of the hand forged, clay tempered process. You add the fact the craftsman hand polish the surface until it reaches a mirror like surface, you have the beginnings of a very special collection. All this and we haven’t even mentioned the shirasaya handle yet. This refined design is made from rosewood and is complimented by a saya made with buffalo horn. 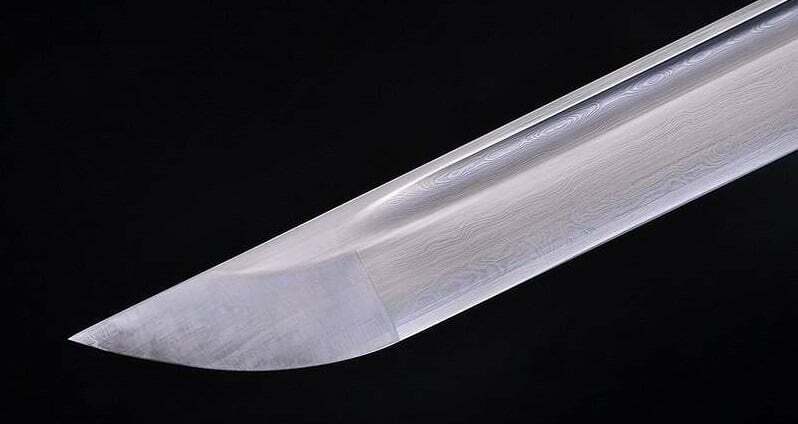 The full tang blade is secured with two mekugi and features a mei. The blade is also hand sharpened before shipping. More suitable for display rather than dojo use. If you are in the market for buying a shirasaya and you intend on starting (or even adding to) a collection, this is our top pick for you. 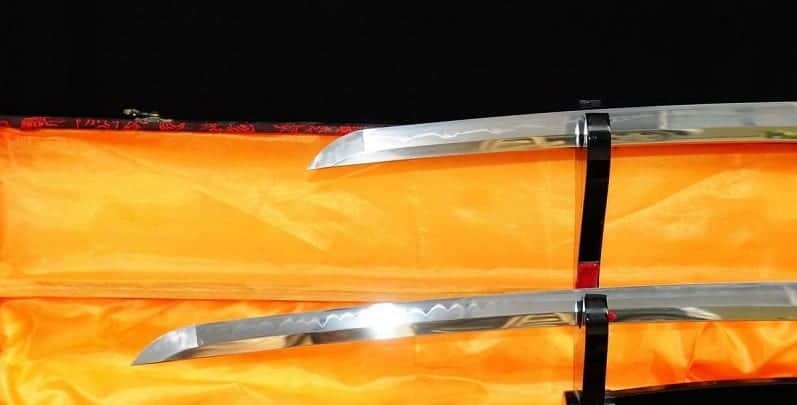 Featuring a katana and a wakizashi – both complimenting each other in design (using traditional Japanese building methods) – these are two beautiful pieces that you will certainly be proud of. This is a more budget friendly shirasaya when compared to our first two choices, and it is built in the Japanese ninjato style. However, the lower price does not mean a big drop in quality; far from it. Traditional Japanese forging methods have been employed, with the blade being folded 13 times resulting in 8,192 layers. 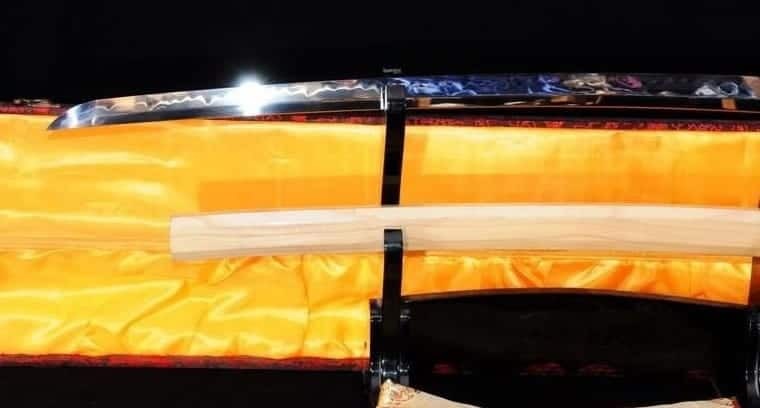 Not only does this make for a strong blade that is as comfortable in a dojo as it is in a display case, the folding process also provides a visible grain pattern that is pleasing on the eye. The steel is also heat-treated, tempered, and oil quenched; processes that provide both strength and flexibility. The blade is hand polished using multiple grades of sharpening stone. By the time it reaches your door, you can use the blade surface as a wall mirror. The shirasaya design utilises a natural rosewood saya that matches the handle perfectly. Overall this is a sophisticated shirasaya ninja sword. The sleek, dark red design with that lovely hand polished folded steel make for a no frills shirasaya that looks and feels very sleek indeed. Highly recommended should the style suit your aesthetic preference. 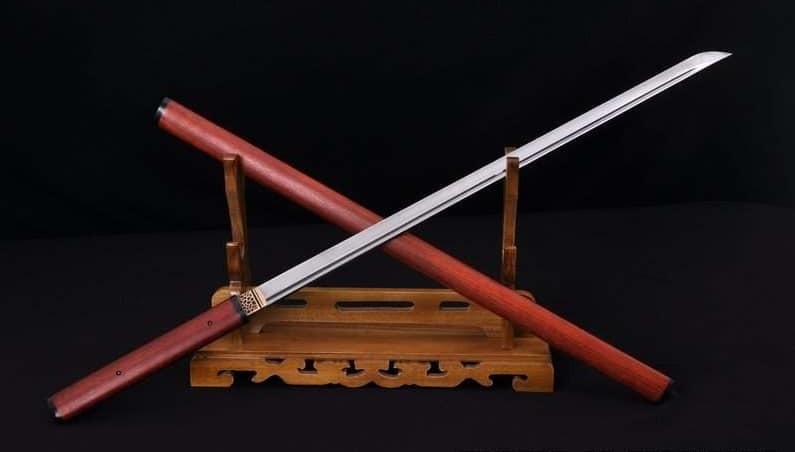 This rather striking red shirasaya katana sword is another worthy item to any display collection. Beyond the sleek aesthetic of the shirasaya design, (and the aforementioned bright red colorization) you have a strong sword that is forged using traditional methods. The process used here is folded steel forging. Over 8,000 layers result from the 13 folds. Furthermore, an oxidisation process is employed on the blade that results in the jet black surface you see in the pictures. Offset against the red african rosewood saya with buffalo horn and matching handle, and you have a display piece that will certainly impress. 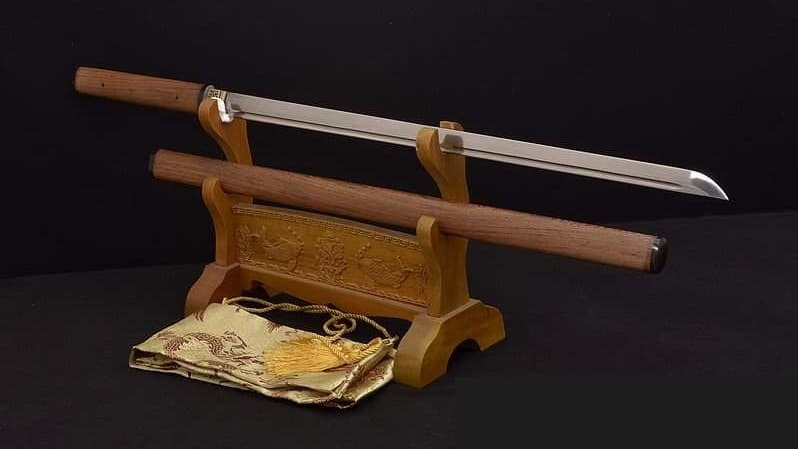 Overall this is a well made shirasaya katana that is designed to get your attention. Highly recommended if you are a fan of the striking red and black design. For those that prefer their shirasaya display sword to be a little more subtle, may need to look elsewhere. The final offering in our top 5 shirasaya review round up is another nijato style sword that uses a striking red finish (similar to the katana reviewed above), but opts for a more traditional aesthetic on the blade itself. Made of 1095 high carbon steel this is another piece that can be used either for display or in the dojo. 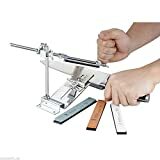 The clay tempered finish provides that lovely genuine hamon, while the craftsman ensure to hand polish the blade to a mirror like finish before it reaches your door. The traditional forging techniques include repeated heat treatment to remove impurities. The hand sharpened blade is also constructed as full tang. The finishing touches come in the form of a beautiful african rosewood shirasaya style handle and saya with buffalo horn. Overall, this sleek katana shiasaya balances price and utility with overall aesthetic to a very pleasing degree. Add that to the fact it features a genuine hamon and you have a delightful looking shirasaya. Highly recommended.